World's Best Story: A unique contest for writers! What is World's Best Story? "This is not just a literary contest, we're looking for stories that will be consumed in multiple media formats – from books to the big screen and beyond," says Vincent Salera, founder of World's Best Story. "Our goal is to revolutionize the traditional literary contest and identify a story with blockbuster appeal. We're looking for a story that audiences will love and help authors turn that story into trans-media franchises, which is why we're empowering readers to judge the contest." 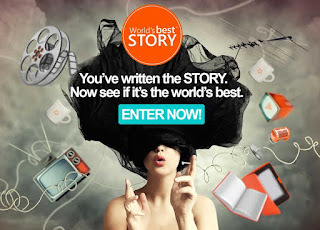 Readers will vote for stories and awarded judges will declare the final Top 10 winners. The top 3 winners will receive a full publishing package by FriesenPress, trademark protection in the U.S. and Canada by IP agency Benoit & Cote, a virtual book tour by Laura Fabiani of iRead Book Tours as well as consulting/marketing services with book expert Anne Chaconas of BadAss Marketing. Busbud and YoDough will be providing lots of goodies for both writers and readers. How do I submit my story? To learn more about World's Best Story, including how to enter, please visit World's Best Story.